It was an exciting day! We woke early in the morning to get ready for cousin's wedding. Went to auntie's house for 1/2 hour and we had to rush to the church for the rehearsal. J was very beautiful and S looked soooo handsome! When the rehearsal was abt to start, Z refused to do it. :( Fortunately they have a backup plan. Thank you, S & J..... Though it was only the 2ND meeting for the kids, they enjoyed each other company. Must be the lollipop that worked (CH bought each of them a lollipop)! In the evening, there were 3 pairs of flower kids. Since Z did not want to do it, I asked my auntie's neighbour son to walk in with my girl. They all did a great job! The school celebrated children's day today with a picnic. Parents and teachers played games with the children, some parents volunteered to bring in goodies (lazy mommy like me did that hehehe...) do face painting, shows and storytelling too! L enjoyed watching the magic show and the 'freeze' game. While Z enjoyed bubbles, ball games and storytelling. They had a great time especially with lots of goodies for them to munch! We had a great time shopping with Doreen! Finally bought her shoes for my cousin's wedding. She was soooo tired that she fell asleep while on the way to dinner with Daddy & Z. It was great that I'm spending time with her again.... 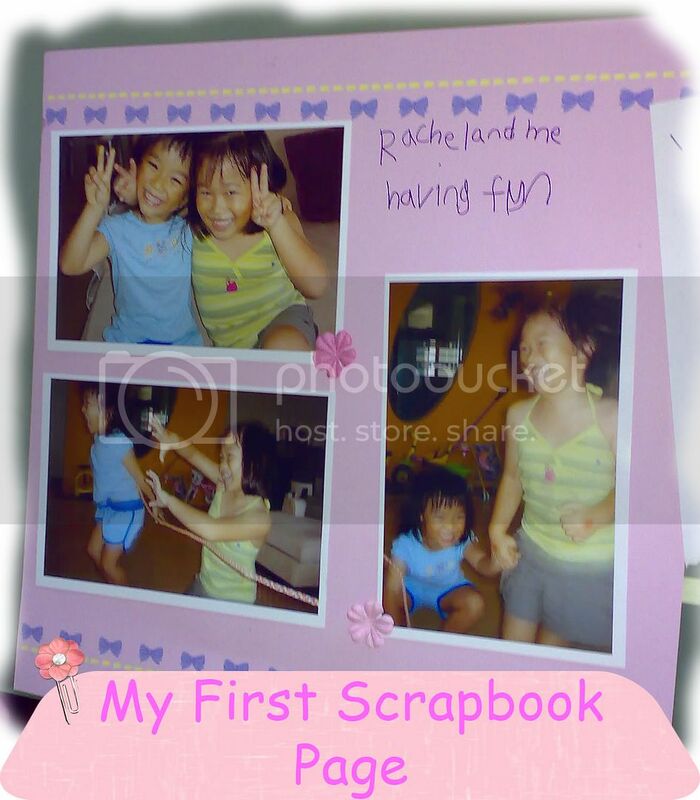 I asked her if she would like to do it again and when she grow up, will she do it too, her answer was "YES! I love to go out with mommy!" L supposed to have a haircut this evening, but then we realised that they charge $16 just to cut the fringe! So decided to go back to our regular hairdresser another day. I was glad to be able to spend some times alone with L, looking at things, laughing at little things that we saw etc.... Really missed it.... We had a good time together. I hope when she grow up, she will look forward to going out with me too. As for Z, he was spending time alone with Daddy. We went for the Mobilekids Tour this afternoon. It is a new concept to teach the children abt road safety. Thanks to my friend! L & Z looked forward to it. Z probably was the youngest player as the games are for children from P1 to P6. L was very serious while playing the games. Do you know what's a kerb drill? U probably will think it is "look left then right". No! It's "look right, left then right again" Think abt it... When you are standing by the side of the road (in S'pore), vehicles are coming from which direction? When we are using the road, we have to listen too. Why? Coz sometimes our views are blocked or there are cars coming from the back. By listening, it will tell us the speed & direction of the vehicles and we will avoid being hit. I would like to thank the facilitators for taking good care of them! While we were on our way home, L pointed to those people that have committed traffic mistakes. Gagaga... I'm very glad that she learned something from the trip! 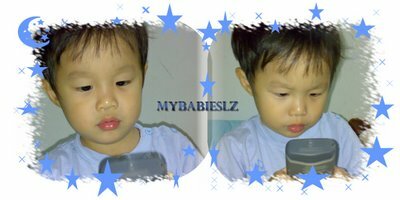 L & Z current interest is playing game with daddy's handphone, 'Snake'. He is pretty good with it. 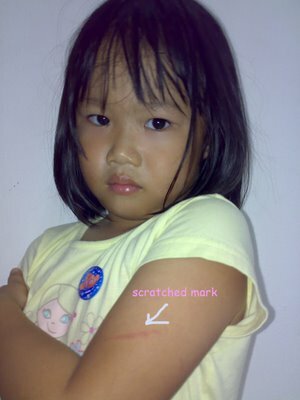 L came bk with a scratched mark on her arm on Friday (22/09/06) and she told me that it was her Chinese teacher who did this. I was disappointed that no one called, write notes in her book or email me regarding this. L told me that she was naughty and Ms Z pulled her by the arm and scratched her. Ms Z was trying to stop her from playing with the mattresses after they woke up from their nap. While she was having her afternoon snack, Ms Z applied some cream for her. When I arrived at the school this morning, Ms Z apologised to me for what happened. I told her that I was unhappy that no one informed me abt what happened and I got to find out from my girl again. This is not right! According to her, she has informed the principal (P) abt it and P asked her to give us a call which she failed to do it. She was very very busy and it slipped her mind. Of coz she forgot! This teacher is overload with 2 classes in her hand! She should have write a note or called us during weekends and not wait till Monday! Z loves Goofy.... Most children like Mickey Mouse or Donald Duck but not my boy. So this is for him! 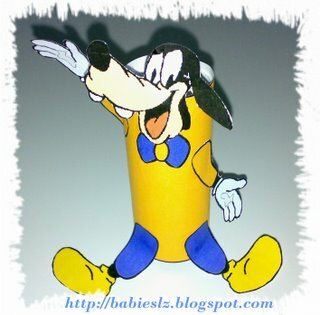 A goofy craft from here. Thanks to Bits & Bites. Made this so he can bring it to school for show & tell. 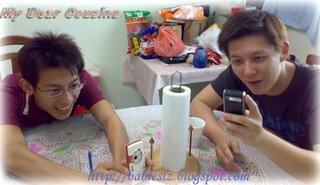 We were at my uncle's place.... Times passes very fast. Next Saturday will be my cousin's wedding. Lots of our relatives were there. Met one of my distant cousins that I have not seen for 20 yrs! L & Z had lots of fun playing with my cousins who are kids themselves and my nephew, R. They played computer games and Nintendo DS. It was a nice gathering! My sis teaching L how to play the game and she's hooked! Z was very engrossed playing the fighting game on the computer that he was oblivious to what was going on in the house. Bob The Builder Is Coming! Bob The Builder is coming in November! Check out details HERE. My friend called me last week to tell me abt it. We decided to bring our kids for the show and today, we finally bought the tickets! Hurray! If you are a HSBC card holder, you get 20% discount (applicable from 22 Sept to 22 Oct 2006). The duration for the show is abt 50 mins. NOTE: "No photography, video recording and audio recording is allowed for this event!" In the evening at abt 8pm, we went to the church for rehearsal. L was very excited, asked if she can wear the dress tonight. Told her the dress is for the actual day. Z was excited too coz we were going out. It was very sweet of Jac to plan to let them be in the front row but they have no experience at all so told her that it would be better if they were the second pair (they have 2 pairs of children). The other girl, Cassandra, has been a flower girl for 5 times! The boy, Ryan is older too. Ryan's mommy and me were thinking that Ryan & L will look better together but I was concerned for my boy. At least I know that he will most likely listen to Jiejie. The subsequent practice, he was alright. Know why? I put a small packet of Ribena sweet in his pocket, told him that if he can walk down the aisle, I will open it for him. Gagaga.... It worked! On that day, I'll have to get lots of sweets to 'bribe' him! They need to do it twice, church & dinner. That will probably be the only day that they have unlimited sweets! Hope they will be alright on that day if not will have to pull them out. Field trip again! 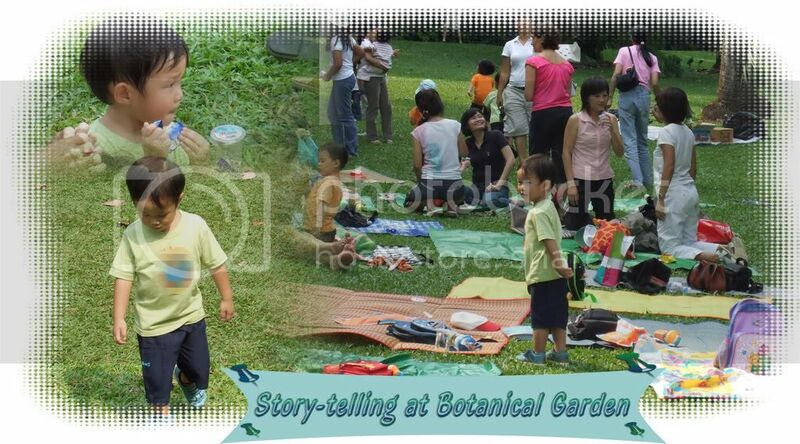 We went to Botanical Garden for storytelling & picnic. It was a trip for parents & child. Z & me thoroughly enjoyed the trip! The storyteller was fantastic! Z sat with me throughout the session, listening and saying the rhymes. Wished it was a trip for L too. This is really a good way for parents & child to bond. L went to the play gym today. She told me she had lots of fun.... She wore socks to school today as the teacher told us that the gym required them to. I was worried that she will forget but she didn't. When she was in nursery, sometimes she will come home with missing hankies or hairband or hair clips. Now that doesn't happen anymore coz my girl has grown up! :) When she comes home from school, she will take out her hair band/clips and put it back in the box. L decided to draw baby teeth and Z wanted dino's teeth. When they have completed, both were 'biting'each other with their new 'teeth'! 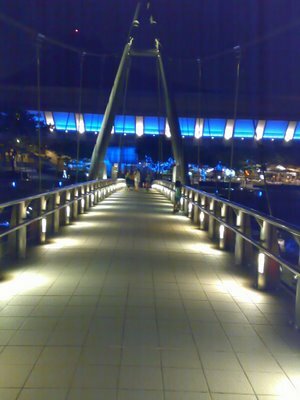 We went to Stadium Waterfront for dinner with our friends and L & Z were happily running along the bridge. L loves taking pics but not Z..... Everytime I asked him, he said "NO!" 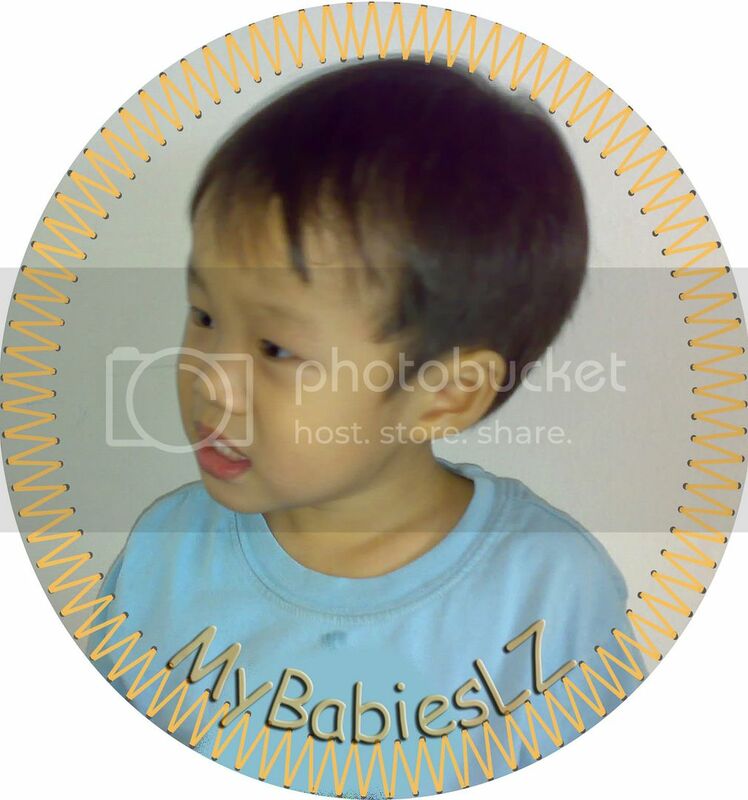 Everyday before My babies leave for school, we will put on mosquito patch for them. When they come home, they will stick it in the toilet. 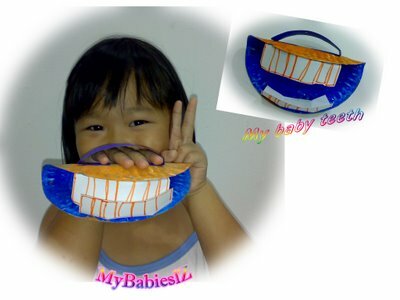 I don't know how she come out with this idea, to use it for artwork :) She showed it to me after she has completed it. 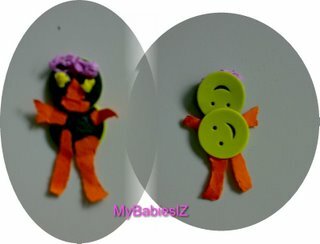 She used those leftover papers from the teacher's day card to make this. 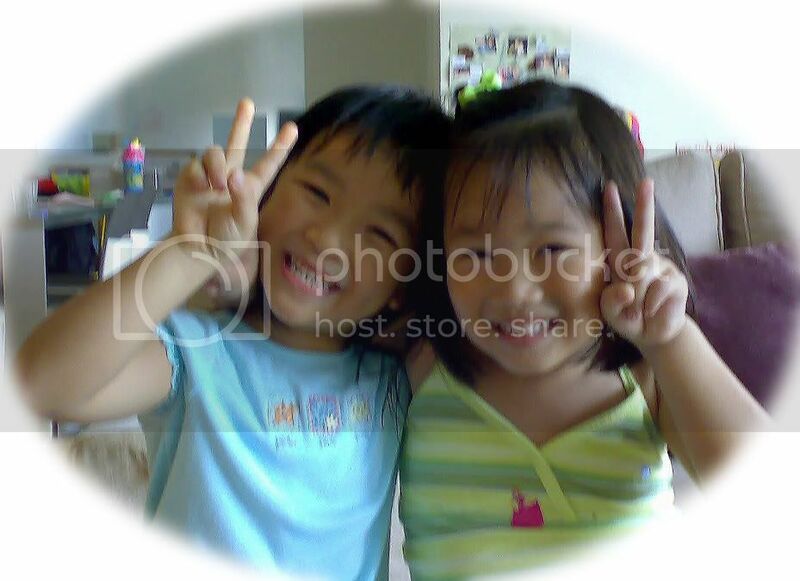 So cute hor? 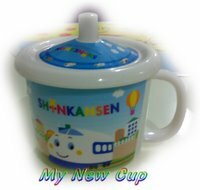 Have been looking for a cup with cover, finally found one when I went shopping with him the other day. He likes using it! Z did not go to school since tuesday till now..... When I asked him if he wants to school, he said no. Though he has been very 'sticky'....... Mommy this & mommy that, I enjoyed these few days being with him. While showering for L, Daddy had this 'cute' conversation with her. L : Daddy, this is not real, it's just a toy! Daddy : Then it's not necessary to shower for your doll! Dr S said:" Wow! Your plane can fly!" L : Dr, this is just a toy! 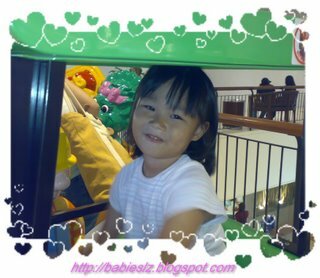 Z did not go to school today and we went to orchard rd to meet my friend. I felt bad that I had to bring him out with me when he has not fully recovered but I will be busy next week and I may not have time to look for the clothes. 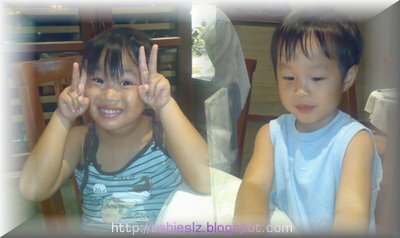 My cousin's wedding is near and they are going to be the flower girl & page boy. Before we left the house, I told him to choose a few cars to bring along. Then he asked:"What abt Jiejie?" Very sweet of him to think of L when we were going out. 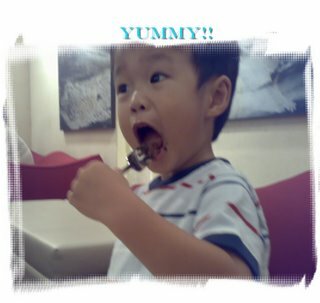 After shopping for awhile, we had late lunch at one of the cafe and Z can't resist the temptation to have a choc cake. Then we took MRT, it was Z 2nd time taking the ride and he was very excited (though it was only 1 station)! L asked me this morning,"mommy can I make a card for Didi?" Me : Of course, sweetie! 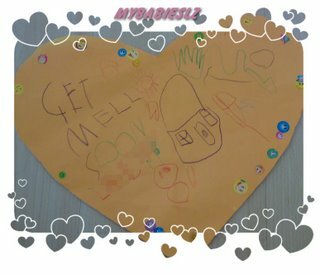 L : mommy, do u remember I made a card for him when he was sick? L : Can I draw for him? Me : U can draw or make a card for him. I'm sure didi will like it. 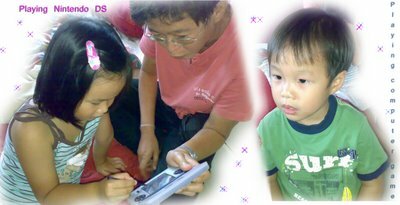 Her chinese teacher told me (when I pick her up) that L went to ask Ms S how to spell her brother's name (L knew that she was Z's teacher) . pic that she did this afternoon.... Funny hor? 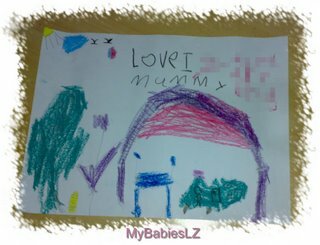 She wrote didi's name and 'I love mummy'. When I asked her, she can't explained it :) Hmmmm.... She think of me too much liao... Hehehe... My sweet little girl, thank you for drawing this pic to cheer Z up! Z was running a fever so brought him to the doc again this evening. Doctor S said that is because he didn't take his antibiotic. He apologised for giving us that antibiotic but I don't blamed him. I was given a choice of antibiotics, 1 that taste ok but may take longer to recover or the other that taste horrible but most effective, we chose the latter. I was worried if that is pneumonia, Doctor said it is upper respiratory infection and not that. Z vomited the medicine each time he took it. It hurt to see that..... Whenever it was time to feed him, he will point to the white bottle and said,"I don't want that!" We brought the medicine along to change. When Z saw the Doctor S, he gave it to him and told him that he doesn't like it. This morning Z woke up very early and ask for his milk and breakfast. He remembered that I bought char siew pau last night and asked for it. After having his breakfast, he decide that that it was time for L to wake up and he woke jiejie up! 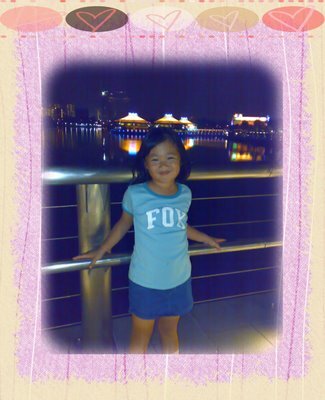 In the evening, we went to visit Ah Mah. Almost everyone was there! There was lots of yummy food prepared by uncles & aunties except me ;). With 2 young children, An Mah would normally tell us no need to cook anything. It was very sweet of her. 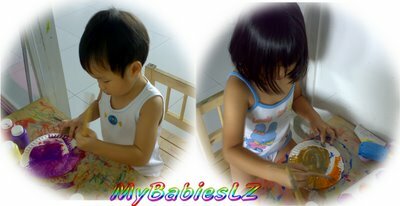 L & Z had lots of fun playing with all the gorgors & jiejies though they are much older. I grew up in a small family and I wished I had so many cousin to play with. I felt very blessed, to have such a big family that love us sooo much especially my kids. Everytime we have a gathering, we (esp my kids) look forward to it! At 8+, it was time for us to go home coz Z needed to take his medicine. Daddy bought Z to the doctor this morning and Doctor said it was a 'regular' cough but he needs to take antibiotics. Phew! I know I shouldn't sound glad when he need to take antibiotic but I was more concern what if he has pheumonia. Doctor said that the antibiotics taste horrible and most kids don't like it but it is most effective. If he doesn't want to take it, he will change for it, 1 for 1. How right he was! Z puke as soon as he take it and in the evening, we decided to 'force' and 'bribe' him. well, it didn't work so we will have to change to the other medicine though it will take longer time to recover. He is still active, playing with Jiejie, running around and has a good appetite. We received email from school that one of Z's classmates have pneumonia, caused by mycoplasmic bacteria. It is contagious and Z is having cough again! Glad that he is not having fever and we will have to send him to the doctor again tomorrow. L decided to massage daddy while he was watching TV. She has been a very sweet girl.... Giving us a massage whenever she thinks that we are tired. Sometimes Z will do that for us too. She may be naughty at times but we still love her very much. Pic taken before leaving for school. They love giving each other a hug! Daddy & L had this conversation after their bedtime stories. She is such a darling! We love her sooooo much! She always say things that melt our heart. ps: This post is writted by DH. Coz I forgot the exact words that she used and I kept asking him to repeat. Z very much like daddy, crazy over cars! When he saw daddy's car magazines, he sat quietly for a long time flipping thru them. He pointed at the cars and asked me "What this?". I told him the names and he will repeat after me. L joined in too! Daddy had a ear infection and he had a tiny gauze in his ear. When L & Z saw it, they said "Eeeeeeee...." and ran away. But when they knew that daddy were having an ear infection, they sayang him. Hope daddy will recover soon. I Can Take Off My Pajamas! This morning, Z removed his pajamas on his own (usually I have to help him with his top)! 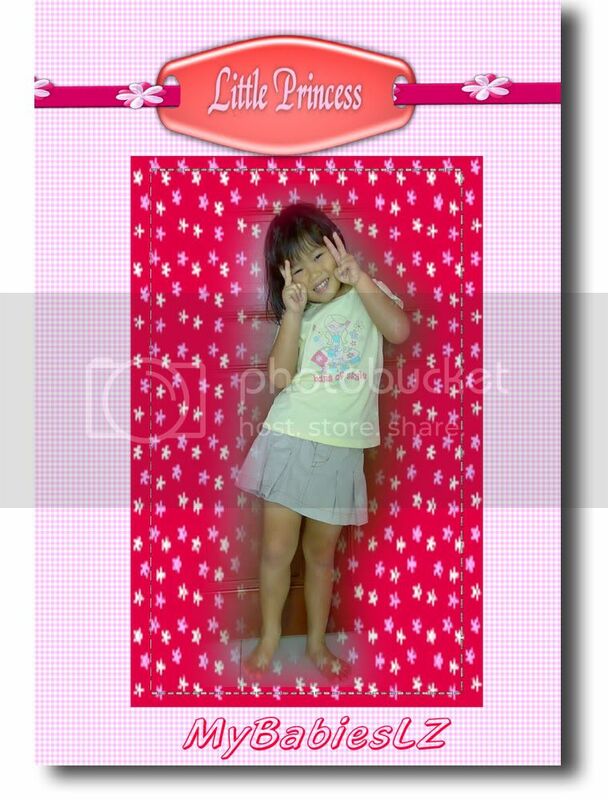 L was very happy for her didi, excitedly told us abt it. This morning Z removed his pajamas on his own (usually we have to help him to remove the top)! He said: "I DID it!" Then he followed Jiejie to the toilet to brush his teeth without us prompting. Good job! Sometimes he still likes to have gel for his hair, esp when he sees me putting hair clips for his Jiejie. 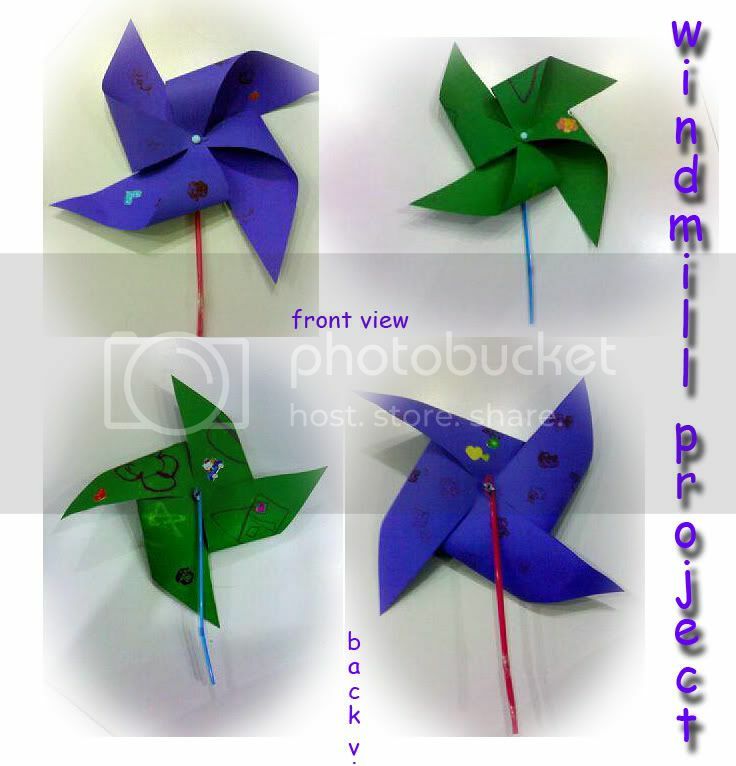 L has been asking me when are we going to do the windmill so decided to do it today. Got this idea from the Disney programme, Out Of The Box. Thought that I could remembered all the steps but I forgot the most important part, which was how to stick the straw to the back. Haiz... Sign of old age. L drew some pics and put stickers on the construction paper. Z did stamping and put stickers on his. 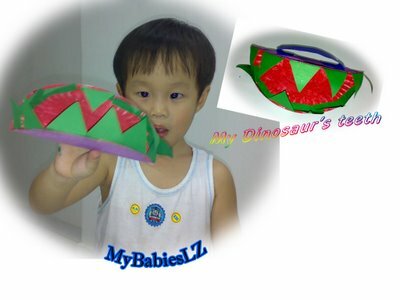 - Fold the paper in triangle shape and cut according to the line (do not cut to the end, leave a gap). - Then take alternate corners and punch holes at the tip (don forget to punch hole in the centre of the paper & make sure that the hole are big enough for the fastener to go ard). -Put fastener and 1 bead (for the weight). I cut the tip of the straw into half so that I can stick it on the bead. We were happy with the results. They were running ard with it and guess what? The windmills can turn leh! This evening we had dinner with our friends again. Shirley ordered a seafood pasta with chilli and it was yummy! Z decided that he wants to try it too. We told him there was chilli but he insisted. His reaction after the first spoonful was "Arrggh! Chilli!" LOL. He then continued with it! Such a pity that I didn't record it on video. Think he is going to be like me.... I love spicy food, the hotter the better! 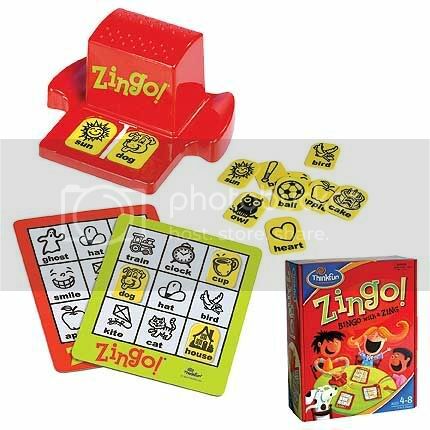 Recently we love playing Zingo. Though it recommended age to play was from 4yrs old, Z loves the game. L recognised the words and even tried spelling it! Sometimes daddy will join in the fun if he's free. Of coz mommy always lost the game. When it was time to go home, L & Z reminded me to bring home those paintings that they did. They were sooo tired that as soon as we reached home, both fell asleep.